Toronto’s real estate market has been a little rocky this year. The market had a slow start to the year, but home sales and prices have risen during the summer and fall months. October saw strong sales compared to this time last year. 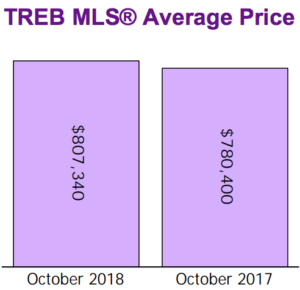 The Toronto Real Estate Board says the average sale price was $807,340 in October. This is a 3.5 per cent increase from $780,400 year-over-year. The month-to-month selling price has also increased. Selling prices were up last month by one per cent compared to September. The number of sales also increased from October of last year. 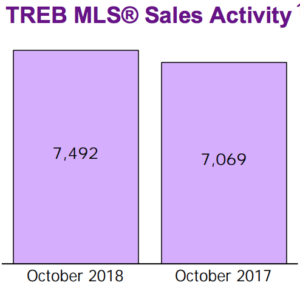 TREB reported 7,492 sales in October, up 6 per cent from last October. While there has been growth in sales and prices, there has been a decrease in the number of properties listed. Toronto’s real estate market has been tight for the past few years, with fewer listings appearing. In October there were 14,431 new listing. This was down 2.7 per cent from October 2017. Condos and higher density low-rise sectors were the driving force behind the GTA’s increased sales. 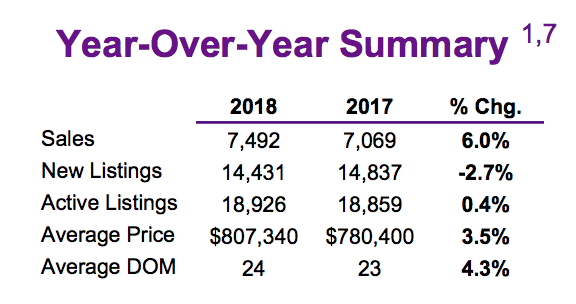 TREB notes that annual sales growth has outstripped annual listing growth. This highlights Toronto’s property supply issue. However, a number of new condo buildings are expected to be completed soon, which should alleviate some of the pressure.